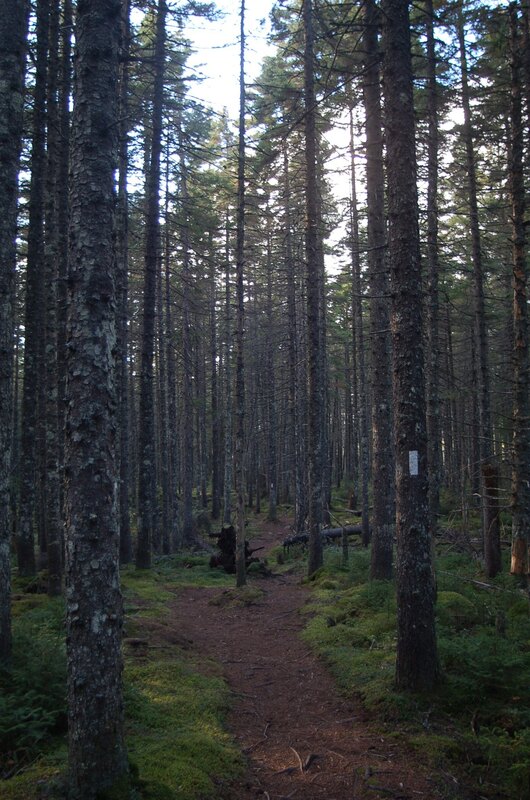 256 miles of the AT in 22 days leaves us 25 miles from the Maine – New Hampshire state line!!!! We are really excited to have made it to Andover , ME. It means we have cranked out a lot of hard miles and we are about to finish the 2nd longest state only to Virginia and 2nd hardest only to New Hampshire . After leaving Stratton on the 23rd, we had to hike through 2 days of cold rain. It was more like walking amongst the clouds and the wet rocks and roots were like walking on ice. We had to climb over Crocker and Sugarloaf Mountain ranges except we couldn’t see anything other than a screen of fog. There was no rain on the 3rd day as hoped and forecasted, which really helped us get up and over the incredible Saddleback Range . The views from the 4000+ ft mountains were incredible. I think we were able to see Mt. Washington for the first time in the distance. We had plans to put in a lot of miles, but when we came across Piazza Rock lean-to, the best well kept lean-to on the AT, we just had to stop. It was an early day, but we built a nice fire, dried out the tent and some clothes, and just enjoyed the evening. We had a huge owl join us by the campfire just after dark. It was so sweet, I could see the fire in his eyes. The next morning, we hiked a couple of miles and hitched a ride into Rangely, so that Tundra Wookie could get some knee braces and grab some grub. It took a couple hours away from our hike, but it was worth it. We still continued to do another 14 miles after our hitch back to the trail head. It feels good to have a good hiking day like that, especially after a long break in the day. Our bodies are becoming more adjusted to the work load that we force on them day-to-day. The following day was bright, as the sun smiled upon us our whole way over the Bemis Mountain Range. The range was not the highest, but the sun on the fall colors bellow was awesome! We were in-between the several peaks when the two of us stopped dead in our tracks, and in silence, listened. It was obvious, there was either a tank running through the trees, or a moose was approaching? We stared, and watched as a Bull Moose, with a rack that four people could sit on, crumpled the surrounding brush as it slowly walked by. It was crazy to see, it was like a mythical creature until you see it so close in the wild. 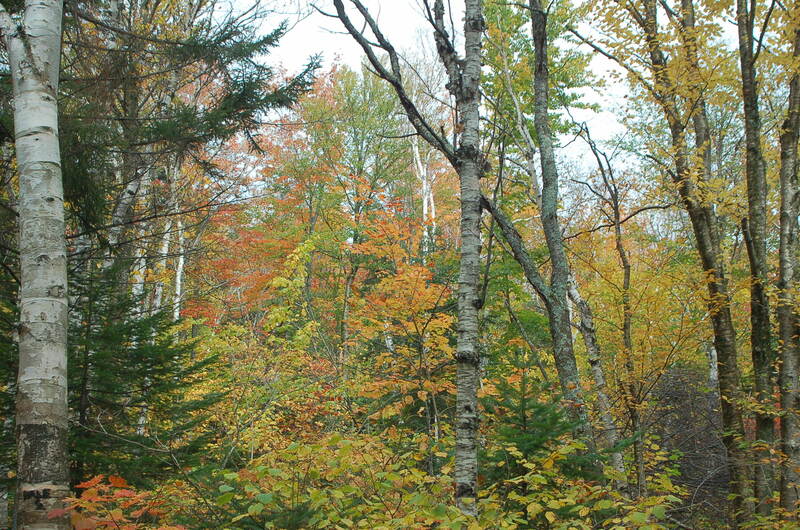 The day was capped off at a tent site by an old state road and a small brook. There we met a couple that was doing several day hikes on their vacation, and had hiked the AT before. We would enjoy in some “Trail Magic” as the couple volunteered two Red Hook Late Harvest Ales that night, and oatmeal cookies the following morning. We built our fire, enjoyed hot cider and our dehydrated lasagna dishes, yum yums. We were visited the next morning by a moose as well, unable to get a look, we could only hear it as it ran though the brook splashing like a stampede of horses. The next morning we moved up, over, and around mountains like they were nothing at all. Before we knew it we had done nearly 11 miles to the road to Andover , the afternoon had barely begun! We are staying at the Roadhouse hostel, it is a little weird for us. The place is great, clean, warm, well equipped, and friendly, that is when people are here. We spend so much time it the wilderness, and then come into the smallest of towns, something we are already not very a custom to. We arrived and a general note on the door says to make yourself at home, so we do. One attendant leaves about an hour into our stay and the other never shows up? So its the two of us in a huge three story B&B style/Hostel, internet, kitchen, bath, living room, dining room, laundry, a dozen private rooms, and bunkhouse all to ourselves, all night. We came and went, to the general store and post office and back. It feels like were not supposed to be here, like we broke in or something. We are enjoying our time and gluttonous urges as we restock, and carefully plan out our hike for the days to come. Our next “Zero Day” is planned for Hanover NH , right before we reach Vermont , about 180 miles from here, our bodies will be fully exhausted by then. We miss everyone very much, and thank you for the strength you give us each day. Everyday becomes more amazing! 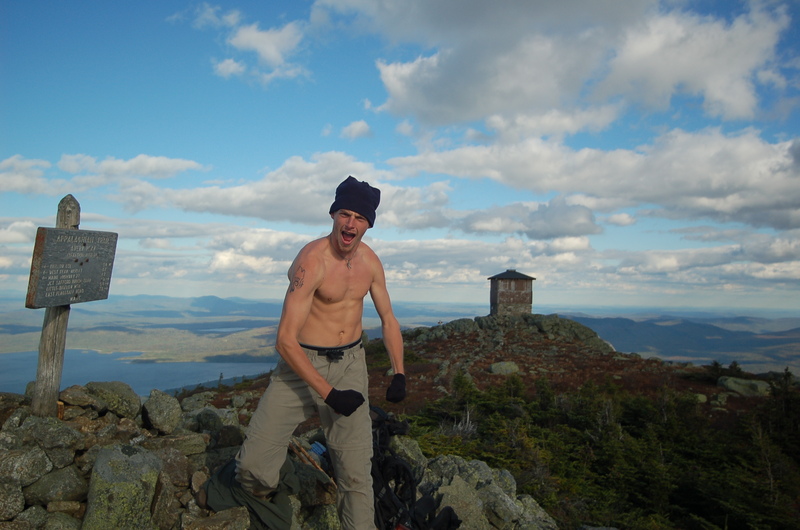 Joe and I took off our shirts atop Avery Mountain for a photo op in the chilly breeze. I feel like this picture summarized our feelings well; we were having fun and enjoying the hike. The Saddleback and Bemis Range have to be two of the most beautiful mountain ranges next to the White Mountains. It is still unreal to think back on some of these days, my heart filled with gratitude to all those that helped us and opened their arms for us. There are a many things and many people that don’t seem to be real anymore. These places and people are far from city life. We had done another gear purge at Andover as well, this took our once 70 pound packs down to the more reasonable 50-55 that we would hike with the rest of the trip.